On Rolling Rd. at Bauer Dr.
Franconia Rd. at Beulah St.
• Va. Dept. of Motor Veh. West on Fairfax County Pkwy. Roll mouse pointer over names below without clicking to see anchor stores. on Old Keene Mill Rd. • West Spfld Sh. Ctr. • Kings Park Sh. Ctr. before S. Van Dorn St.
You will find a number of communities named HiddenBrooke that were built by Brookfield Homes throughout the United States. This particular one is in West Springfield, Virginia, 15 miles south of Washington D.C. Our HiddenBrooke consists of 91 condominium apartments in four buildings, and was completed in 2005. The builder named each building for a famous jazz player or singer, but among ourselves we refer to them as Buildings 1, 2, 3, and 4. They are, respectively, Haden House, Hancock House, Hampton House and Holiday House. 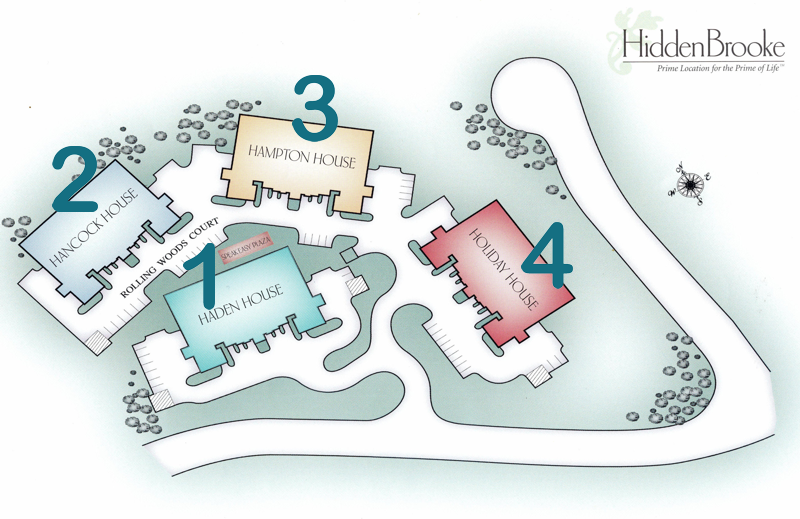 All four buildings are the same size and with the same layout, except that Haden House, Building 1, houses our common room, library, and exercise room in place of apartment 103. The buildings are four stories high, arranged on a terraced slope with their entrances on the second floor, so they look smaller than they really are. First floor apartments are at the back of each building, at ground level all around, and have roofed walk-out patios. All other apartments feature nine foot deep balconies. There are five different floor plans for the 91 apartments, also named for famous jazz players and singers. There are four apartments each on the first two floors, eight on the third and seven on the fourth. The builder installed electric fireplaces in each apartment, and all apartments have nine-foot ceilings and elaborate crown molding in their entry ways and living rooms. Eighteen of the 23 apartments in each building include a garage. The individual upward-acting doors to the garages line the façade and sides of each building, and all reachable from the second floor hallway. 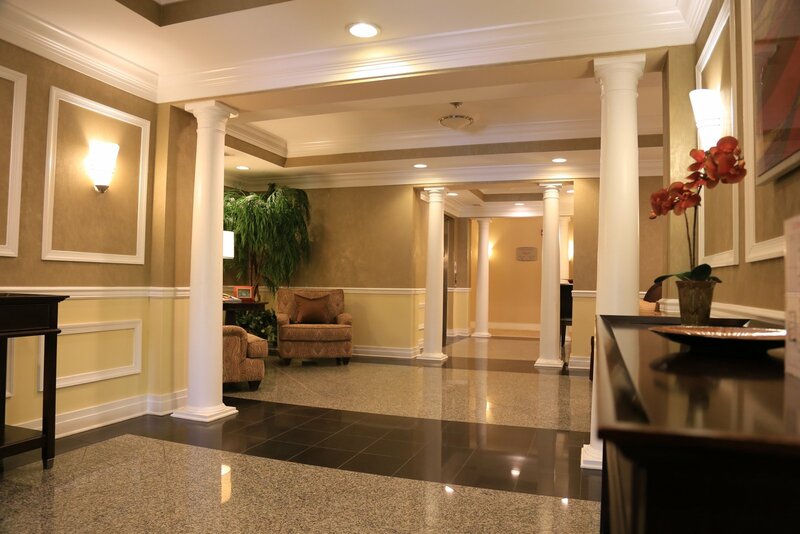 Each building has a large, well decorated lobby floored in marble with comfortable arm chairs, sideboards, and tables. An elevator and two stairwells provide access to the four floors. Mailboxes are in the vestibule, whose inside doors are secured. Residents can use their key-fobs or their door-codes to gain access to the lobby. Visitors can use the intercom to look up the name of a resident and call the apartment to request access. The carpeted hallways are painted warm gold, appointed with sconce and ceiling lighting, and with coffered ceilings and archways to break up long hallways to provide visual elegance. We call our common room “The Bistro,” a cozy meeting place with kitchen facilities. It features five four-top tables, a long leather banquette, comfortable chairs and a television screen with surround-sound speakers. A separate room houses the library. 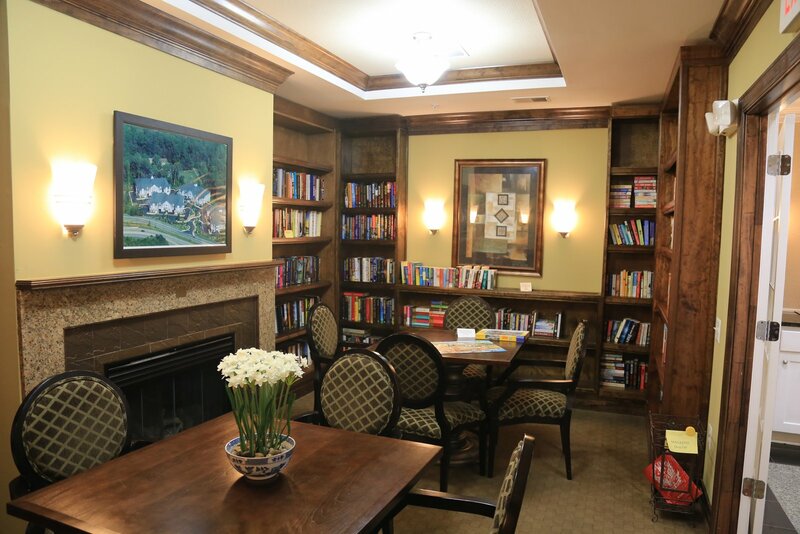 It has a fireplace and two four-top tables, with its walls lined with shelves holding books donated by residents. The exercise room features Precor equipment and separate men’s and women’s rest rooms complete the suite. An open Wi-Fi signal is available that spills out to The Bistro’s terrace, an outdoor space with eight tables with umbrellas, an elaborate brick fireplace, and a gas grill. Down the steps is the shuffleboard court. The landscaped grounds include grassy areas, flower beds, and woods left in their natural state. A branch of Fairfax County’s Cross Country Trail passes in front of Hiddenbrooke’s entrance along Hunter Village Drive. 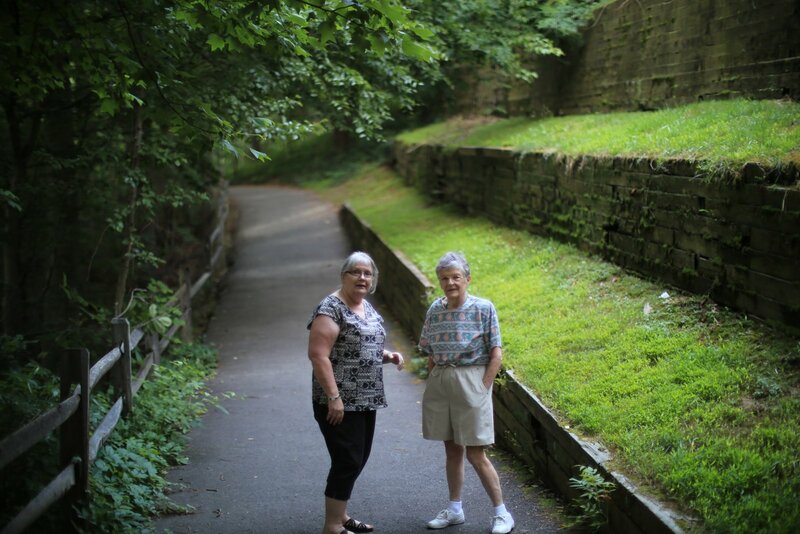 A short walk will take you to Accotink Creek, deep under the cool tree canopy in summer, and a long hike or bike ride on the CCT will take you most anywhere in the county, along the Potomac, and into Washington. In the other direction on the trail you can reach the Occoquan. A two mile walk on sidewalks will take you to West Springfield’s shopping centers at Rolling and Old Keene Mill road (you have to detour on neighborhood sidewalks where Rolling Road narrows). Plenty of sidewalks on adjoining neighborhoods mean that you can take a different jog or walk every day of the week. HiddenBrooke is conveniently located at the intersection of two parkways and Rolling Road, equidistant by car to West Springfield, Saratoga, and Springfield Plaza shopping and restaurants, all six minutes away. Eight minutes is all it takes to get to the newly rebuilt shopping mall, Springfield Town Center, with its department stores, boutiques and restaurants. And the Franconia-Springfield Metro station also eight minutes away: your best way to Alexandria, Arlington, and the rest of the Washington Metropolitan Area. Twenty minutes is also a magic number. You can get to Fairfax City, Alexandria, Occoquan, Merrifield, Shirlington, and even George Washington’s Mount Vernon estate by car in 20 minutes or less. You can also find nature’s quiet and seclusion a short drive from HiddenBrooke at Hidden Pond Nature Center, eight minutes away. Also 8 minutes away is the more active South Run Park, where you’ll find an indoor pool and plenty of wide-open spaces. Twelve minutes gets you to the merry-go-round, paddle boats, picnic pavilion and trails at Lake Accotink Park. Sixteen minutes to huge Burke Lake Park. And then there’s golf, not quiet and secluded, but still out in nature and only six minutes away at the Springfield Golf and Country Club, or 16 minutes away at the public course at Burke Lake Golf Center. Want to go for a swim in the summer? Consider joining the Rolling Forest Pool just a short walk away on Flax Street. But it’s you and your neighbors that make up our community, and they are just down the hall or across the court. 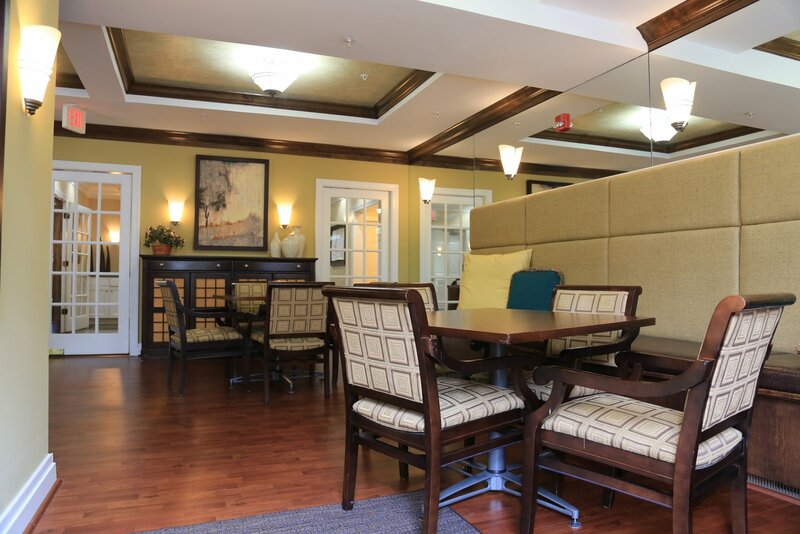 You’ll find your neighbors here at HiddenBrooke pleasant, friendly and fun. Check the monthly calendar on this website or in the lobby for scheduled activities and events, or just decide to do something and call around to see who might be interested in joining you. This is our HiddenBrooke. Make it yours too.